All are indeed welcome to this particularly busy ministry of St. James, as I came to find out. I spoke with Eda Scales and Noni Stanford, two of the soup kitchen coordinators, last Tuesday as they were preparing to serve over 200 people for the annual Thanksgiving dinner. Even though I arrived at 11 am, well before the usual serving hour, most of the tables in the hall were already full of people chatting and having steaming cups of coffee, enjoying each other’s company and relaxing before the beginning of the meal. Volunteers zipped back and forth, topping up glasses and making last minute preparations, but everyone I passed had enough time to smile and say hello as they went about the business of Thanksgiving dinner. The food program at St. James has been running continuously since 2001, serving hot meals once a week to anyone who drops in. The first few dinners had perhaps a dozen people in attendance, but numbers have increased steadily to the point that on any given Tuesday there are at least a hundred people in and out of St. James’ hall, sharing a meal and fellowship (and double that for the Thanksgiving celebration). 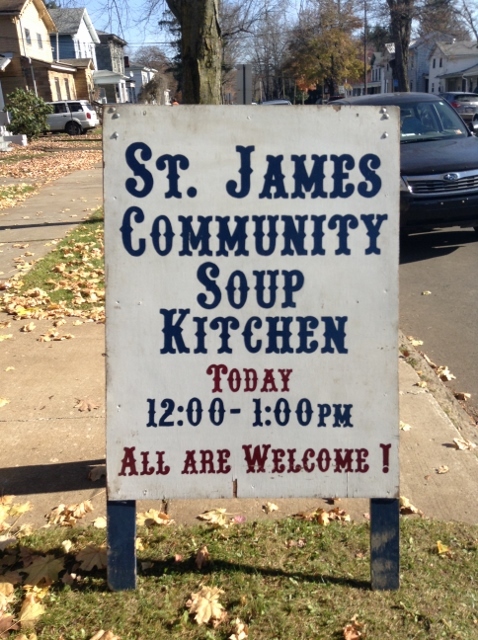 Volunteer participation is both ecumenical and community-oriented: at least four churches in the area send helpers to aid the St. James’ crew, and they are often joined by women from the St. James House – a shelter program run by the local YWCA that is housed in the old church rectory. On the few occasions when Canon Martha Ishman is unable to attend dinners, Pastor Terry Brown of the Methodist church in Enterprise gives the blessing before the meal. The program was given a jumpstart in its early days with a grant from the Diocese, but between donations from parishioners and support from local groups and businesses like Northwest Hardwoods, the VFW, United Way, and a partnership with the Second Harvest Food Bank, the soup kitchen ministry is now self-sufficient and able to provide hot meals and groceries for people in and around the Titusville area. It is also one of the only regularly scheduled soup kitchens in the area that doesn’t charge a fee for the meal. Eda pointed out to me that not only does the program meet financial, social, and spiritual needs for attendees in general, it is particularly valuable to people with special circumstances: the working poor, people on fixed incomes or Social Security, and others who may not qualify for assistance programs, but still find themselves in need. There are no qualifiers to participate in the food ministry, and everything is on the honor system – if someone says they have a need, they may receive. The program also encompasses the God’s Abundance Cupboard food pantry, which began on an emergency basis whenever the church was open, and has since grown so that there are now twice-monthly scheduled pickup days where families can come and get a bag of groceries including fruit, cereal, soup, vegetables, and (thanks to a grant from Giant Eagle) two packages of frozen meat. The food pantry now gives out approximately 70 bags of groceries each pickup day. The financial benefit of the meals and grocery donations is readily evident when you see the number of people who participate in the program. As I walked around the tables and chatted with people the social and spiritual benefits made themselves known. For many of the attendees, the soup kitchen is about much more than a hot meal – it’s an important social space, and a church outside of church. From Noni: “If you miss a week or something, they ask ‘where were you last week?’ They feel like this is their church, even if they don’t all come on Sundays.” It’s obvious that the people visiting last Tuesday felt at home. Chatter passed back and forth between people and tables with a familiarity that only comes from regular interaction. I sat down near the kitchen to chat with one young woman and her 14-month old daughter, and she mentioned that she was there because her parents came regularly. Her father was seated further down the table, and he introduced me to his wife, one of his cousins, and another relative (who was one of the volunteers, and not able to sit with them as he was working). He said how much they appreciate the church, and his wife jumped in to tell me a story about how one of the previous priests, after seeing that she had been crying at one of the meals, was able to get them help that saved them from being evicted from their home. Both volunteers and people sitting at tables stopped me as I walked around and asked if I needed a seat or a plate, and there wasn’t a single table where someone didn’t have a story or a joke to share (or a groan about the upcoming snow in the weather forecast). As Eda had said while we talked, “you see the face of God in everyone around the tables.” If the smiles on the faces of the volunteers are any indication, they receive as much joy in giving as the attendees do in receiving. Noni walked by with a large tray filled with slices of pumpkin pie, signaling an end to the first wave of dining, and I waved goodbye and worked my way back through the tables towards the exit. Knots of people who had finished eating or were waiting for spaces to open up at the tables stood in the entry hall and outside on the sidewalk, and several folks wished me a happy holiday as I zipped up my jacket and headed down the street. I walked out the doors of the hall that day far more uplifted in spirit than I had been prior to arriving. The weather may be getting colder and the days shorter, but God’s presence in this ministry will continue warming hearts throughout western PA’s people for hopefully many years to come. This entry was posted in Events, love, Ministries, Mission, service, Stories of Hope, Uncategorized, workers. Bookmark the permalink.